Welcome to Our Lady Queen of Peace! Bishop Henry Murphy created the parish of Our Lady Queen of Peace on September 21 1961. Before 1961, this area had been part of the parish of Donaghmore/Knockea. 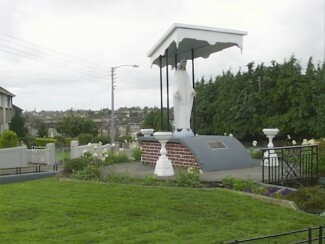 Until the creation of Our Lady Queen of Peace parish, the church in this area had been used as a chapel of ease in the parish of Donaghmore/Knockea. The church was built to accommodate the expanding suburb of Janesboro. The area was further divided when the south of the parish was separated to create the Holy Family parish on December 9 1969. The present day population of the parish is around 5,000. Our Lady Queen of Peace parish today: Click here to go to the Our Lady Queen of Peace parish website.